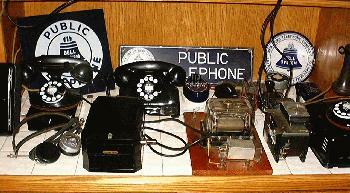 Here are some of the telephones and related apparatus in my personal collection. Most of the items are of Western Electric manufacture, but other manufacturers are represented. There are quite a number of photos on the page, and depending on the speed of your Internet link, it may take some time to load. Please be patient. The phones are grouped according to type. Scroll through the whole page, or click to go right to what you want to look at. Western Electric referred to telephones that sat on a desk "Desk Stands." I guess the term was used to distinguish these phones from the wooden wall sets that prevailed before the introduction of the desk telephone. The wooden wall phones that pre-dated the desk stands were complete telephones, i.e. 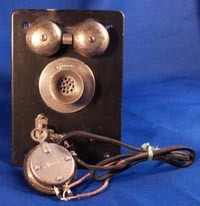 all of the components necessary for operating as a telephone were located in one unit that bolted to the wall. Desk stands contained only a few components, usually the transmitter and receiver, hookswitch, and later, the dial. 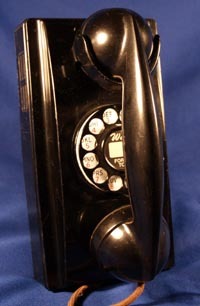 Here's a Western Electric 51AL dial "candlestick" telephone, the first dial telephone widely manufactured by Western Electric for its new panel dial switching system in the late teens. 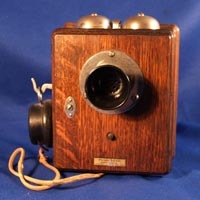 Mine is shown sitting atop its subset box, a device necessary for many old telephones which is normally mounted on a wall. The subset contains the ringer and "guts" of the telephone. The technology of the time could not produce components small enough to fit within the "desk stand" or the part that has the dial, receiver and transmitter. Here we have a Western Electric type 20 manual candlestick telephone. 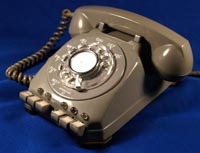 Even though this is an earlier telephone than the dial 'stick, this particular example has a later "bulldog" transmitter, which contains the same transmitter, or microphone, element as later "F" type handsets. 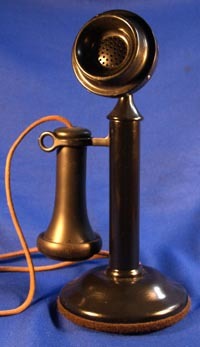 Western Electric also manufactured candlestick telephones with a nickel plating. One would assume that these phones would be for a "more refined" customer, but I don't really know for sure. They do make a nice looking telephone, though. This desk stand is also a 20AL, like the black one above. As telephones evolved from the candlestick, the next desk stands to appear were of the variety with handsets and in some cases dials. Here is a Western Electric "B Mounting" dial desk stand. This was Western Electric's more widely manufactured desk stand, which followed the much sought after A1 desk stand. The B1 here is often referred to as a "102" since they were usually wired for sidetone. A slightly later desk stand is the Western Electric "D Mounting" or "202" non-dial desk stand with E1 handset. D stands were usually wired for anti-sidetone which the Bell System called "202" wiring, hence D1s often being referred to as 202s. 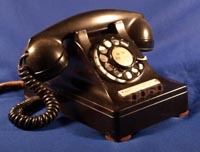 It is more correct to refer to this style phone as a "D mounting", however, and the phone above as a "B Mounting." This is a Western Electric 440 multiline desk telephone from the late 1940s. This particular set was intended for use with Western Electric's "1A" key system, which was very simple. Note that the buttons on this set are solid and do not light up. Some versions of 1A did not support button lamps. I have a 1A key system unit that works well with this phone and the equipment simply provides a means of holding a line. There were many varieties of 1A KSUs that had other functionality. The 400 series of Western Electric key sets (above) were the multiline versions of the 302. With the development of the 500 desk set, key set versions of it followed. Here is a Western Electric 544 key set, essentially the newer version of the 440 set above. Note, however that this set has the clear line buttons which can be lighted. This set is also compatible with 1A, 1A1 and 1A2 key systems. 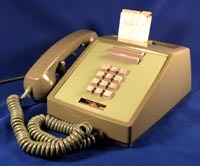 There were other versions of the 540 series that worked with Western Electric PBX equipment. 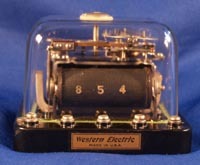 The Western Electric 1A key system was superceded by the 1A1 and 1A2 key systems. 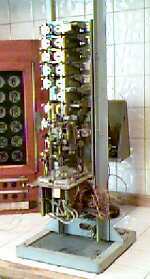 The 1A2 system was developed in the mid-1960s and was extremely popular. 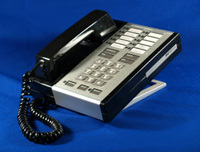 Other telephone manufacturers made both key system units and telephone sets that were compatible with the WE 1A2 series of equipment well into the 1980s. Pictured here is a Western Electric 564 key set, a very popular key telephone that was made for many years and in many colors by Western Electric, ITT and others. This is an earlier WE set, as evidenced by the round line buttons. Later sets had square line buttons. Western Electric made a multiline wall set, the 2851. 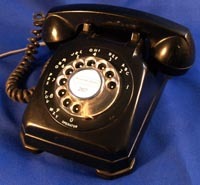 There was also a rotary dial version, the 851. 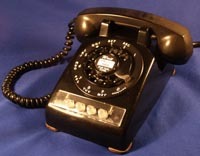 Both the tone and rotary versions of this phone were available in several colors. Before this set made its appearance, multiline access for wall phones was handled with a separate key box and a standard 554 wall set. Another 1A2 compatible set was manufactured by Northern Telecom, their Logic 6. NT's Logic series had sets with differing numbers of available line buttons, as well as headset options. 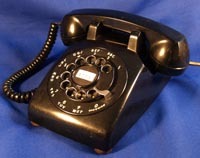 Yet another 1A2 compatible telephone was manufactured by Comdial, their model 3528. 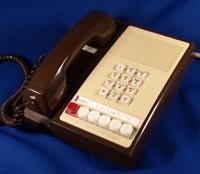 The 3528s were available in a couple of colors and were convertible to wall mounting by reversing the upper and lower halves of the phone's case and unscrewing a handset retaining peg under the cradle. Some manufacturers had key sets that required no KSU. This is a Stromberg Carlson example, from their 1700 series of key sets. The only external equipment needed with these sets was a power supply to operate the line lamps. The hold function was handled internally in the set, with a power resistor. Note the individual hold (red) buttons for each line. The sets could be connected together so that the line lamps would light accordingly on all stations so others would know which lines were in use. The line lamps are a little different from what 1A2 users would be familiar with. The hold button lights when a line is in use, not the line button itself. The line buttons flicker when the line rings due to the neon lamp at each line button. 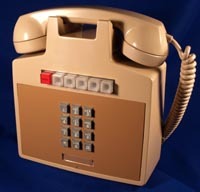 Western Electric made an attempt at a KSU-less key system in the mid-1970s with the ComKey 416 system. 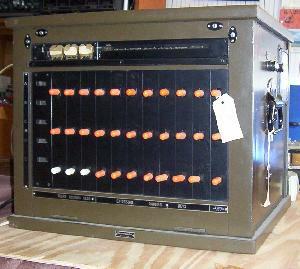 While providing many of the functions of a basic 1A2 system (hold, lamp functions, intercom), the "KSU" was contained in the "Master" set, pictured here. Smaller "satellite" sets would be connected to the master set. The capacity of this system was four central office lines and 16 stations. Each Master set would handle two central office lines, so if you had three or four lines, two Master sets would be needed. 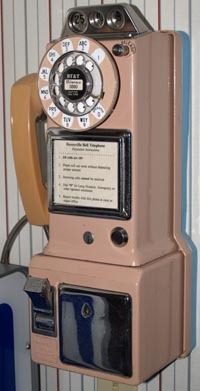 The intercom was a voice-announce system by selecting the intercom line button and holding down the station button (in the top center group) and announcing yourself to the called station. An interesting system, albeit a bit unwieldly since the master sets are rather large. Here's another multiline entry from Stromberg Carlson, their model 1575. While designed to work with SC's key system equipment, the action of the line buttons and leads are compatible with the Western Electric 1A2 system. Automatic Electric made an intriguing key set to be used to allow one single-line telephone to answer and hold a number of lines, and is referred to as a "secretarial unit." This interesting contraption requires no external circuitry except a power supply to work the common ringing circuit in it. 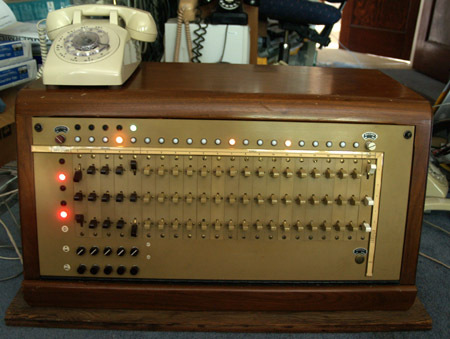 Neon bulbs flash on the ringing lines, and the operator can answer (key to middle position) or hold (top key position) any of the lines, which would allow a secretary to answer phones in a department when someone would be away from their desk. One of the last key systems made by Western Electric before the breakup of the Bell System was the popular Merlin series. 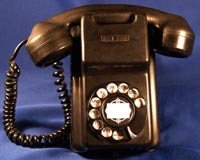 Pictured here is the 10-line version of the Merlin phone. They were made in a couple of different configurations of line buttons and possible accessories, as well as several colors. The distinctive electronic ringing warbles of the Merlin sets was carried over into later AT&T/Lucent key and PBX systems. A mid-1950s version of the Western Electric wall telephone, the 354. 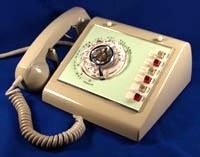 It has the same internal components as the popular 302 desk telephone set. It was also manufactured in ivory. 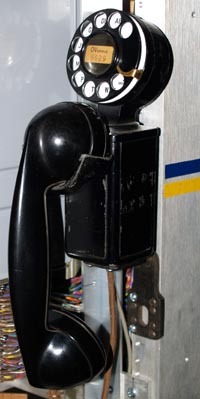 Here's an early version of a wall-mounted telephone, the Western Electric "hanging handset," sometimes called a 201, and was a set that with minor revisions (see a later example below) was manufactured into the late 1960s. 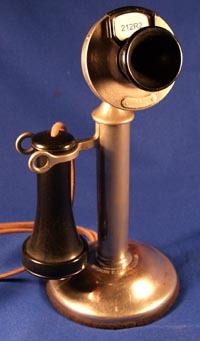 This handset stand, like other early telephones, requires a separate subset that contains the ringer and coil, i.e. "the guts" of the phone (See the dial candlestick above). This phone is equipped with an "E" handset. This is a later version of the "hanging handset." The body of the phone is now square (the earlier one above has a rectangular body), and the dial mount can be adjusted only left-right. The dial mount of the early 201 above can be adjusted in all axes. This phone has an "F" handset and requires a subset. This one is currently installed on the equipment frame of my step switch. 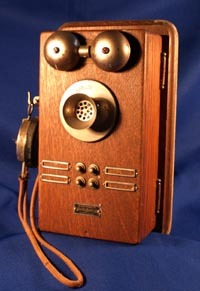 Automatic Electric (GTE) made their own version of the hanging handset, and called theirs a "Space Maker" telephone. 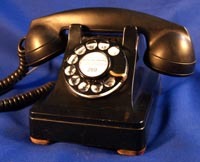 This is a later example, and unlike the Western Electric examples above, this telephone contains the internal induction coil and is a complete telephone, except for a ringer. It also has a later "G" style ITT handset. The 1949 release of the Western Electric 500 desk set saw the introduction a few years later of the 554 wall set. Both the 500 desk set and the 554 wall sets were designed by the famous Henry Dreyfus (who designed several other telephone sets for WE). 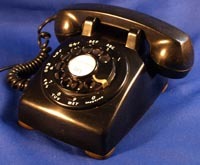 The 554's design, like the 500, was licensed by Western Electric to be made by other telephone manufacturers. This particular well-used later example was made by ITT. An interesting design trivia tidbit about the 554 are the "shoulders" on the top of the 554's body: they are there so that the handset can be hung there when getting someone to the phone, or to go get a pencil and paper to take a message without having to leave the handset dangling on its cord. Neat, huh? This is a specialized wall set, an elevator phone, Western Electric's model 322. These were installed in elevator cars as emergency phones and were available both with and without dials. At its heart, this set is a 302, containing all the same components as the popular desk set, with the exception of the ringer. This phone has a 4E buzzer instead of a ringer. 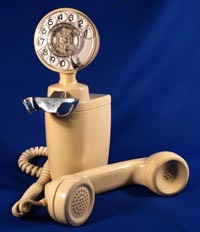 This wall telephone was made by Kellogg and is the wall version of its popular desk set, the "red bar" as it has the wide red hook switch like its desk counterpart. 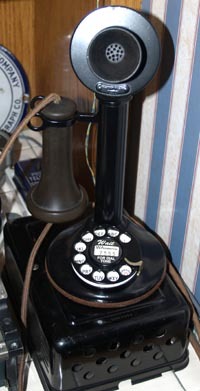 This is my Western Electric 233 pay telephone, a 3-slot pay station. 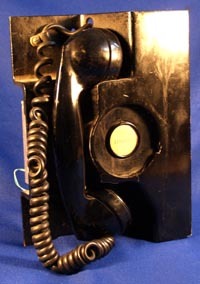 It is among the last 3-slot pay telephones made by Western Electric before the development of the single-slot pay phone, with which we are familiar today. My 233 is wired to work not only as a phone, but the coin mechanism also works. I have posted a copy of the schematic to operate the coin relay. Click on the link to look at it. I am often asked about how to wire a 3-slot pay station to work as an ordinary extension telephone. Most 3-slot paystations are not complete telephones, much like the desk stands above. They require an external "subset" which contains the electrical guts of a phone, namely the network and ringer. You need at least a network to wire up a 233 as a working telephone. I have posted a scan of the schematic for a 234-type paystation, which is electrically the same as a 233. You can omit the connections to the coin relay and the "Coin Relay Dial Shorting" connections for operation as an ordinary extension. You can purchase subsets and networks at various old telephone parts dealers. In 1937, Western Electric came out with a new concept in telephones: an instrument that contained the entire "telephone" in one case that could sit on a desk: bell, coil, handset, hookswitch, dial, etc. This telephone was the 302. One of the new features of these all-in-one-piece phones was its flexibility to meet a variety of installation requirements. A non-dial set could be created by removing the dial and replacing it with a dial blank (or "apparatus blank" as WE called it) and could be converted back to dial just as easily. The WE 302 evolved into the WE 500, introduced around 1950. This is an extremely successful design which has endured for over 50 years, and has been emulated by other manufacturers. The WE 500 was issued in colors almost from the start. This beige example is from the first year that the -60 color was issued, 1957. The popularity of the WE 500 was almost immediate, and customers were clamoring for the new sets. As a stop-gap measure, Western Electric came up with a cross-over set, the 5302. This set is essentially a 302 with a different housing: the base, dial, ringer, coil and often the handset are the same as found in a 302. With the new housing, though, the old 302 looks very much like a 500. The 5302 case could accomdate either an "F" or "G" handset. I have some close-up photos of some of the internal components of one of my 5302 sets. One of the emulations of the WE 500 by another manufacturer is the Stromberg Carlson 1543. Electrically similar to the WE 500, the SC 1543 is an all-in-one-piece desk telephone, that had the added feature of being able to be converted into a wall set by changing the plungers on the cradle and inverting the dial. The SC 1543 also has the capability of being converted to local battery service, something the WE 500 doesn't do! Here is an emulation of the WE 302 set made by North Electric (not Northern Electric!) of Galion, OH, their model 7H6. The internals of this phone are pretty much the same as a WE 302. About the only difference is the AE-style dial, and "turned sideways" case. Another 302 emulation is this Federal Telephone & Radio 802 desk telephone. 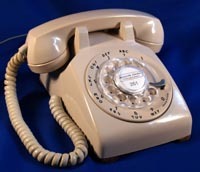 At first glance it is very similar to the WE 302, but on closer inspection we find an Automatic Electric dial, the hand grip in the back is a different shape, and the cords for the handset and line connections both come out the back of the set. Automatic Electric had their own series of phones, and this is an example of their Model 40 desk set, and was a contemporary of the WE302. 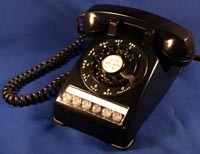 The AE40 was available in a couple of variations, including one with chrome bands around the receiver and transmitter caps of the handset. AE40s can sometimes be found with frequency-selective ringers in them since that was the method of party line signalling most often used by AE's switch gear. Here's a foreign desk set example, an Ericsson. I don't know much about these phones other than this set has had the red light added to it. It's wired to the ringer connections so it flashes when the phone rings. Maybe it was used in an application with a message waiting light. This is a Western Electric 2660 card dialer telephone. From the era before affordable electronic memory, this intriguing telephone was capable of automatically dialing telephone numbers by inserting small credit-card size plastic cards into the gray slot above the touch tone pad and pressing the large gray START button. The number to be called is punched in the card and the mechanism inside the phone reads the holes and sends out the appropriate DTMF digit. 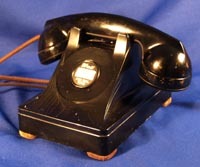 Western Electric also made this telephone in a multiline version. This is a novelty phone from the waning days of the Bell System when the System offered "Design Line" phones for the public. It was a unique arrangement in that the customer bought the body of the phone, but the phone company retained ownership of the electrical parts. 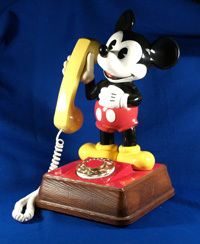 This Design Line phone is the popular Mickey Mouse. The phone is constructed such that the electric works of the phone detach easily from the bottom of the phone, leaving you with just Mickey. Among the non-WE items in the collection are some Samson intercoms. 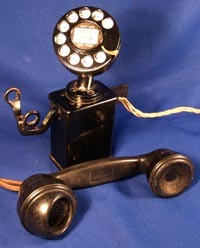 Samson made telephones and components in the 1920s and had a full line of mostly intercommunicating systems. 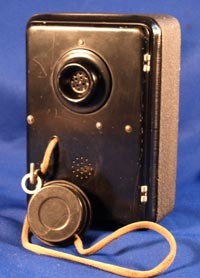 This is an example of their common battery phone which would have been used with a switchboard. This Samson telephone would have been used in a stand-alone setting perhaps in a small office or a large home. Each telephone connected in the system could be individually signalled from the buttons on the face of the phone. 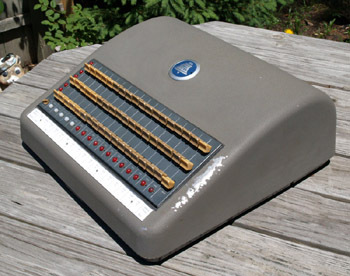 Samson made this particular model (Pattern 351) with a variety of available station buttons, up to 12 according to a late-1920s catalog. Read the original catalog description of this phone. Continuing with the intercom theme, there is also a Western Electric intercom in the collection. Electrically this little wood intercom is very similar to the wood-bodied Samson above. This intercom could be found in similar applications as the Samson: large homes, small offices, etc. A company called Connecticut made telephone products, including this wall-mounted intercom. This unit would have been used with a switchboard, and indeed the elementary school I attended had a system utilizing phones just like these. This is a foreign intercom example, from Great Britain. I can't find a manufacturer's marking on it. It came from someone in Canada. It appears to be a simple battery powered intercom, and there is a small buzzer in the base of the phone. This intercom can be converted to wall use by changing the hookswitch cradle. You would signal the other stations with the white push button on the base. The ingenius device at the left found application on the railroads. Telephone lines between railroad stations were generally a large party line with usually as many telephones as there were stations in the division on that one phone line. 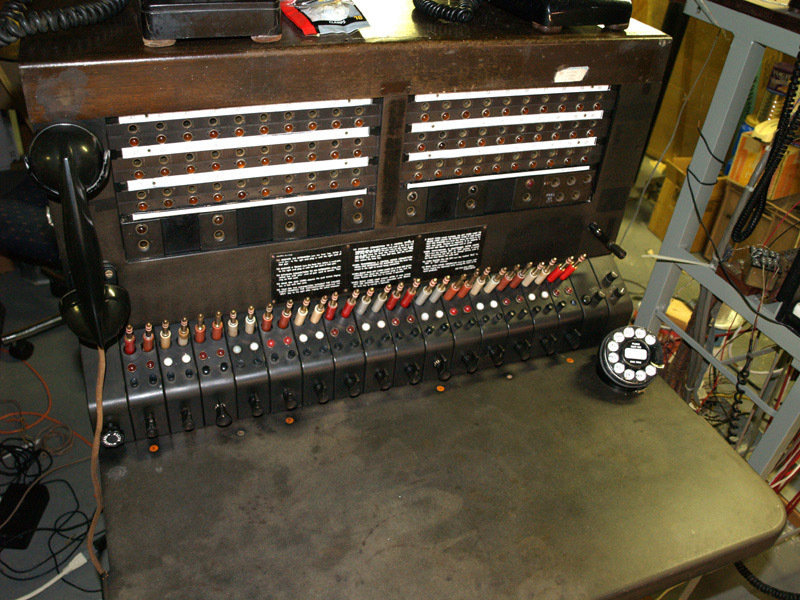 The Western Electric 60AP selector, pictured at left, allowed the dispatcher to individually select any station on the division without ringing the other telephones on the same line. The 60AP works by following pulses sent down the line with a device like the Western Electric 62A selector key shown at right. In the 60AP there is an escapment mechanism that is activated by the pulses sent by the 62A. The right series of pulses steps the cam in the 60AP selector around to close a circuit for the local telephone bell. The pulses in this case total 17 in number and are sent in groups of three, like 5-8-4 or 2-10-5, with a brief pause between each group. Only the cam in the 60AP selector set up to receive a particular code sequence will sucessfully step completely around to the ringing position. The 62A selector key on the right is driven by a small electric motor and the dispatcher would simply press the first number of the three-number sequence on one of the red keys in the top group of buttons, and the last number of the code sequence on the white keys on the bottom. The selector "knows" what the middle number is by the first and last numbers selected and then pulses out the desired code on the line. Among the items in the collection are some step-by-step switches that I used to construct a working telephone switch. I have documented that project online and you can see the progress on the special page I have put up. Pictured here is a connector, which would be the last switch in the train of switches that would connect you to the phone that you wanted. This switch accepts the last two digits of the telephone number by stepping up the number of levels in the second-last digit (10 steps for zero), and over the number of steps in the last digit (again, 10 steps for zero). There is a wave file of this switch working. In the wave file you will hear the switch going active when the phone goes off-hook, working for the digits "9" and "5" and then resetting when the phone is placed back on-hook. Also in the collection is this Western Electric 505C cordless switchboard. 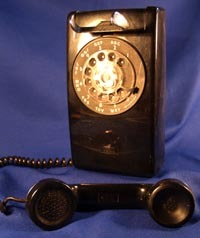 The 505s were a very early cordless board offered by Western Electric, dating back to the late 1920s and early 1930s. This example is a later revamp of the old 505 done by Western Electric for the federal government and Civil Defense in the early 1950s from units being pulled from service. Apparently intended for putting together backup phone circuits in the event of "enemy attack," I am told that one of these refurbished 505s could be found in almost every telephone Central Office as well as larger public air raid shelters. The re-use for Civil Defense explains the military-like Olive Drab color, and carry handles bolted to the sides... although these are rather heavy units, weighing in at a good 50 or 60 pounds. This cordless switchboard will handle up to three incoming phone lines (left-most three columns) and up to seven stations. 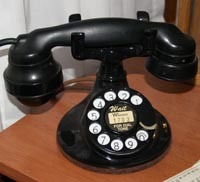 "Cordless" in this context refers to the fact that connections between the telephone stations and the outside lines are set up with the lever "keys" on the front of the unit, rather than with cords and plugs usually associated with switchboards. All of the call progress indicators on this switchboard are mechanical drops, much like those found on annunciators. There are no glowing lamps like on later switchboards of both the corded and cordless variety. This switchboard, like most switchboards, has an internal manual magneto for ringing the attached stations in the event of a failure in the ringing supply. The board pictured works and needs a little TLC to get the lever switches moving easily again and the three bent key handles on the bottom row broke off when trying to straighten them (they're brass) so those will need to be drilled out and redone. Another cordless switchboard in the collection is a Stromberg-Carlson 121. A larger capacity board than the WE 505 above (this can accomodate up to five incoming lines and 16 extensions), and also newer. This switchboard has relay and lamp supervisory circuits in it, the 505 above has only the mechanical "drop" flags. The board is shown in the photo with various lamps lit. The red lights at left indicate that stations on two talking circuits have hung up, the lights on top to the left indicate a ringing incoming line (white) and a line on hold (green). The white lamps to the center and right indicate stations off-hook waiting for service. The beige telephone on top of the board is the attendant's telephone, though not prototypically correct. It should be a S-C phone like a 1244 or 1544, but this much newer ITT phone was handy and I didn't mind re-doing the wiring in it to work as the attendant set for this switchboard. Yet another cordless switchboard in the collection is a Western Electric 507B. WE introduced the 507 in 1952 with two versions, the 507A for three trunks and seven stations and the 507B for five trunks and twelve stations. A modern update of the 506 series, the 507 now sports supervisory lamps instead of magnetic drops. Like the 505 and 506 and the Stromberg 121 the attendant's telephone for the 507 is an external telephone set. Though physically smaller and more sleekly styled (for 1952) than the wooden-cased 505 and 506, the 507 is still rather weighty. After a very long wait I finally have a Western Electric 555 cord switchboard. 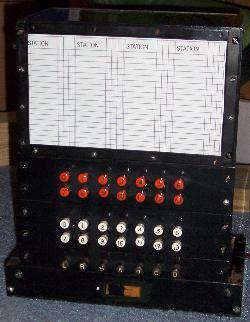 The 555 was a popular switchboard and thousands of units were produced after its introduction in 1949. The 555 came in two configurations, 10 jacks per strip for a total of up to 60 extensions or 20 jacks per strip for a total of up to 120 extensions. The 10 jacks per strip version is more commonly found, and that is what mine is. Mine is fitted for the full 60 extensions. It is not unusual to find 555s fitted for less than their full capacity of stations. My 555 was complete, but filthy. There was a lot of green patina on the brass switchboard plugs. It was a mess. A summer of cleaning got the board looking as it does in the photo. I still need to refinish its wood panels. My 555 also has the conference unit, which is the five-jack cluster in the lower right. Up to five stations or three stations and two outside lines can be connected together for a telephone conference. This 555 has seven trunk units, but can accommodate up to 12 trunks, 14 without the conference unit. The 555 is very modular. The cord units can be easily installed or removed for repair or growing traffic needs. Mine has the full compliment of 15 cord units. Boards with fewer extensions and/or trunks would have fewer cord circuits. Have a question about phones? Check out my new FAQ Page before sending me an email. Your question may be answered there!